What’s good? Finally I’ve found year-round kit which keeps me warm and safe, which looks good and doesn’t limit movement. I was getting tired of wearing all-weather kit which made it nearly impossible to move, made me look like I was wearing a sack, and was heavy to wear off the bike. 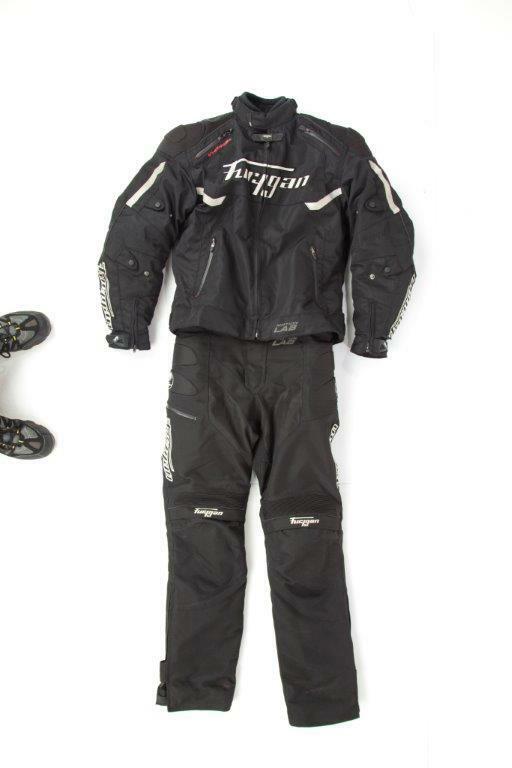 This Furygan kit is a real revelation, as it’s much lighter and more flexible than my previous winter kit. I can now move around freely on the bike and it’s relatively light off the bike. Personally I think it looks good too. It fits in all the right places, feels snug, doesn’t flap around in the wind like a sail - it’s almost sporty. The jacket has CE Level 2 protection on the elbows and shoulder, even a Level 2 back protector. The trousers also have a high level of protection and with added protection on the knees and hips. It’s light weight means I can wear it in summer too, as the jacket has small vents you can open when it gets really warm; you get a lovely air flow through the jacket to keep you cool. Then in winter it keeps the cold out and is waterproof, up to a point. There are five pockets, two on the outside and three on the inside, and an additional pocket on the pants keep dry… just. The pants have a zippable flap on the bottom, which makes it easy to get them off and on. It comes in at under £500 for both, which I think is also very reasonable. It’s not been 100% waterproof as some clothing is, nor as warm in minus figure temperatures, but it’s far more flexible, lighter and better looking. What’s not? It’s not 100% waterproof as it absorbs the water rather than repelling it. This is fine for a few hours in heavy rain, but after around three hours (depending on the bike and conditions) it starts to seep through a little, more so on the jacket than the trousers, but only slightly. The external pockets aren’t 100% waterproof either, though they are good enough for a few hours of hard rain. Also once the temperatures drop into the minus figures you have to start adding additional thermal layers to keep warm, but only if you’re about to embark on a few hours of riding.